If you are the 'WHOTT Dorchester Bus Running Day' Rally organiser and you would like to update or amend the details shown, please contact us. Thank you. When is the next WHOTT Dorchester Bus Running Day? Sunday 11th August, 2019. WHOTT Dorchester Bus Running Day is listed under August 2019 Rallys. Although we try to keep the information for this event as up to date as possible, we cannot guarantee that things haven't changed at the last minute, and we haven't been informed. Therefore, please contact the 'WHOTT Dorchester Bus Running Day' event holder directly to confirm all details (especially event name, dates and location) before setting off to Top o' Town Car Park. The WHOTT Dorchester Bus Running Day is planned to take place at Top o' Town Car Park, Dorchester, Sunday 11th August, 2019. You may reach the event organisers on 01395 567 795. 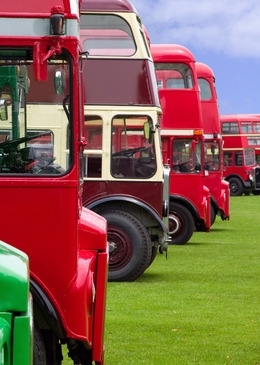 Organised by members of the West Country Historic Omnibus and Transport Trust (WHOTT), this annual event is to be held once again in Dorchester. The show opens to the public at 10.00 a.m. and free buses will run to surrounding destinations. Exhibitors are asked to pre-register by 30th June, preferably by email to: rally@busmuseum.org.uk. For further details please see our web site www.busmuseum.org.uk or call our chairman Robert Crawley on 01395-567795.